Hurricane Harvey has devastated Gulf Coast Texas communities. The Sinclair Broadcast Group Stations have covered the disaster from the very beginning. They witnessed the tragic results and shared stories of the heroic efforts to save lives. 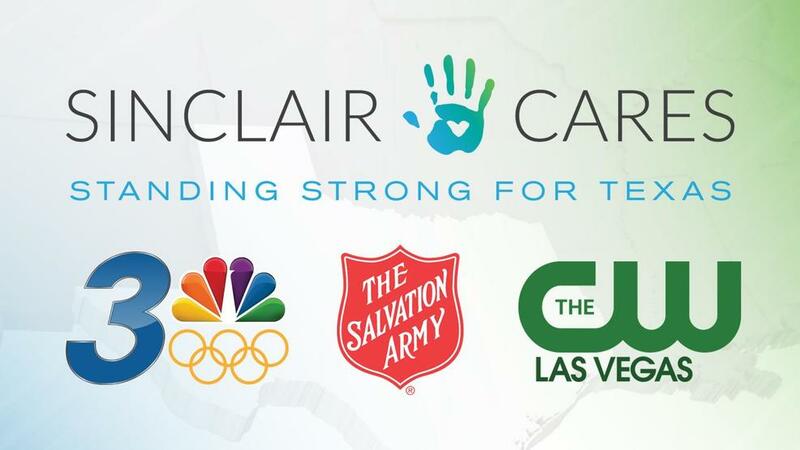 Now, Sinclair Cares has joined hands with the Salvation Army by Standing Strong for Texas to get families impacted by Harvey the resources and help they desperately need. To make that happen, we need your help! Please donate what you can today. Every dollar will help victims get back on their feet and rebuild their communities. In an effort to raise money for Hurricane Harvey victims, we invite you to stop by Terrible Herbst on Desert Inn Road near Fort Apache Road until 7:30 p.m. on Friday. We are accepting checks only, no cash. If you can't make it, feel free to give online.